Groundwork Lawrence is committed to increasing access to high-quality fresh produce in Lawrence, enabling residents to make healthy food choices for themselves and their families. 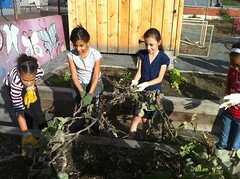 Groundwork’s community food programs combine fresh food access with education in an effort to reduce the city’s disproportionately high rates of diet-related disease. Local Food Lawrence - This brochure highlights locations in Lawrence where regionally sourced fruits and vegetables can be purchased directly or used in meal preparation. Thank you to the USDA Specialty Crop program that made this brochure possible. The Groundwork Farmers Markets/ Mercado de Agricultores are held from July through October, every Wednesday at North Common/Campagnone Park, Friday at 254 Broadway in Methuen, MA and every Saturday at the Sullivan Park corner of North Parish Road (Rt 114) and Winthrop Ave. 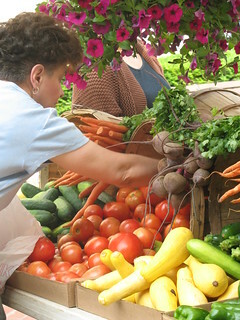 The markets feature a wide variety of local produce. Since assuming management of the downtown market in 2006, GWL has sought to increase access to the market for all shoppers by accepting EBT (SNAP/food stamps) and credit and debit cards, the Holy Family Farmers Market Voucher Program and working to increase the redemption of WIC and Senior Farmers Market coupons. Today, the market provides a lively gathering place for the whole community with free attractions such as live entertainment, family activities and cultural and educational exhibits. GWL supports the operation of a CSA Program, or Community Supported Agriculture Program, at 60 Island Street in partnership with Farmer Dave’s, a progressive, sustainable farm in nearby Dracut, MA. Members invest in Farmer Dave's at the beginning of the season, and in return receive a "share" of the harvest through weekly boxes of fresh, local produce. The CSA provides a convenient solution for people who love the taste of farm-fresh produce, but lack the time to shop, or wherewithal to grow it. Farmer Dave's offers a pre-boxed share or a choose-you-own option. Visit Farmer Dave's website for more information and to register. 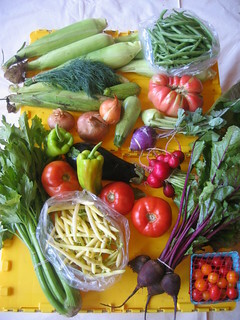 The CSA offers a Groundwork Share-a-Share™ program, funded by donations and grants, to subsidize the price of fresh food for residents in need, including subsidized CSA shares, gift cards and SNAP/WIC incentive programs at our Farmers Markets, and fresh food donations to local food pantries. Please consider making a tax-deductible donation. Groundwork Lawrence operates a growing network of community gardens, providing another source of fresh food to Lawrence residents, while transforming formerly vacant and often contaminated open space into attractive and productive community gathering spots. 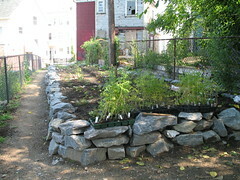 Gardens located at Union/Mechanic streets, Spruce & Myrtle streets, Giuffrida Place, Cross and Cedar streets, and Scarito, Manchester street, Costello and Cronin parks are cultivated and maintained by local resident gardeners and youth. In 2010 we were fortunate enough to be able to plant the City's first Fruit Orchard at the Bodwell site.